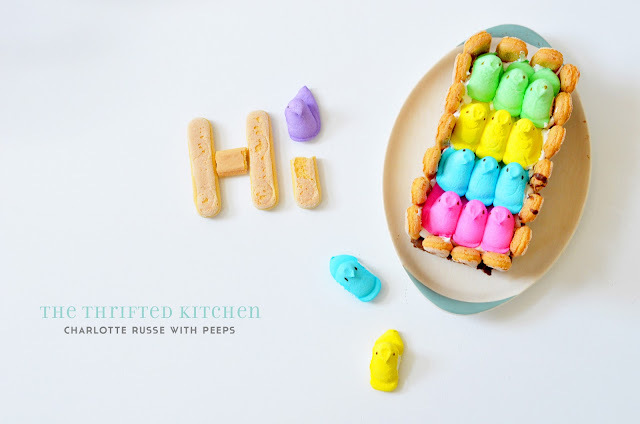 I had SO much fun whipping up this little dessert this week, and I love how easily you can incorporate it into your Easter celebration with the addition of a colorful row of our favorite, sugary, cavity-inducing Easter treats: Peeps! The recipe is for charlotte russe (not the clothing line, mind you), and comes from the April 1967 issue of Better Homes & Gardens. It's a dessert I've seen in pretty much every vintage cookbook I have, but I didn't really know the history of it, so I did a little Inter-webbing to see what I could dig up. The first word in the name, charlotte, seems to be widely debated, but a lot of resources suggest it's a version of an Old English word, charlyt, which means "a dish of custard." The second word, russe, which is French for "Russian," comes from the inventor of the dish, a French chef who named the dessert after Czar Alexander I, his employer. This version of a charlotte is typically constructed with ladyfingers set into a mold and filled with Bavarian cream. So our 1960s version takes that same basic idea, but the custard is instead chocolate. 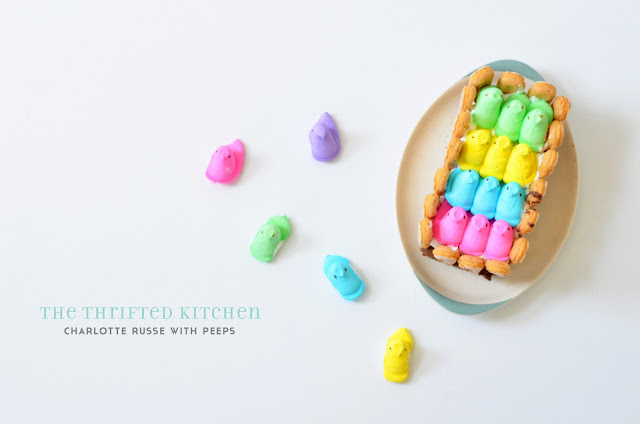 And my Easter 2012 version makes a mockery of it all by topping it with colorful lines of Peeps. :) However, should you want to make it outside of the holiday, I think topping it with strawberries would be delicious. I'm lucky enough to live 4 minutes from The Hill here in St. Louis, so I knew the ladyfingers had to come from Viviano's, an amazing Italian grocer that has everything you could ever want from the boot-shaped country. Those of you in a city without a distinctly Italian neighborhood might try whatever grocery store tends to carry more specialty items. Other than that, the ingredients are pretty straightforward. The method, however, I was quite dubious about. The directions say to line your loaf pan with one sheet of wax paper, leaving some extra to pull the dessert out with. But I'm no fool; I had vision of it dumping out the ends as I pulled it out, so I cut two pieces of wax paper, one to run lengthwise, and one to run perpendicular to it, so the dessert would be supported on all sides. And, after chilling overnight in the fridge, when I pulled it out, it held together quite nicely. All this to say, if you're looking for an easy Easter dessert that elicit "Oooos!" and "Aaaahhs!" from your guests, or maybe just some giggles, then I hope you give this little gem a try. *You'll have to get the bigger package, which is 5.1 ounces, and weigh out what you need. *I didn't split mine because they're crumbly, but you can give it a go. I did have to trim down the ones that lie in the middle, though. If you decide not to halve them, you'll need to get an extra package so you have enough for layering. In a saucepan, combine pudding mix and gelatin; stir in milk. Cook and stir over medium heat till boiling. Remove from heat. Break chocolate into squares and add to hot pudding. Stir till chocolate is melted. Cool completely; then beat smooth. Whip cream; reserve 1 cup for garnish; fold remainder into pudding. Line an 8 1/2 x 4 1/2 x 2 1/2-inch loaf dish with wax paper, extending paper beyond rim. Line bottom and sides with ladyfinger halves. Pour in half of the chocolate mixture. Add a layer of ladyfinger halves and the remaining pudding. Top with remaining ladyfinger halves. Chill 3 to 4 hours or till firm. Aweee! this is sooo cute! 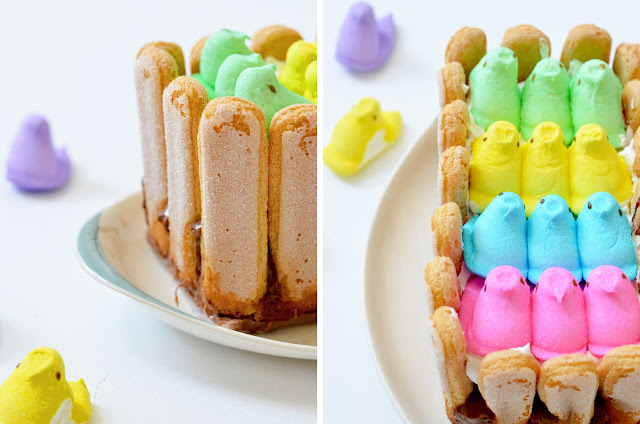 Easter is perfect for cute dessert themes! Love this one!